So, it’s the death of the prospect of making this film the easy way. But the resurrection of the low budget route which fortunately has been kept alive throughout. We’re going to need all the help we can get from all the friends we have. But we’ll get it made. Two things today made me sure. 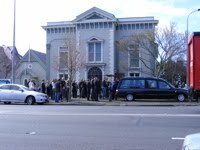 The first was that we just happened to be cruising past the church we want to use as a location when a funeral was spilling out the doors (see photo above). Those in the know will recognise that as a scene from the script! And secondly we spent a wonderful hour down at the boarding house, where the marvellous manager Lynda and my mate Johnny gave us tea and sandwiches (courtesy of Ella), and we had some great conversations with the residents. It reminded me of what this project is all about. We talked of humanity and community and the need for simple things in a world gone mad. This is a story from the grass roots, and that’s the way it will be made. It’s in death that we find life. At least so I’ve been told. Thanks to all those who have believed with us in this film.